Now, leaving aside the fact that it’s, uh, pretty problematic that Indiana Jones is stealing ancient artifacts from indigenous people and his sandbag swap triggers a series of booby traps, I think what he does nicely illustrates something we should do when we’re trying to break bad habits. Instead of trying to break a bad habit cold turkey or replace it with something painfully virtuous, what if we swapped in something slightly less ‘bad’? Click To TweetHere’s the deal: each of our bad habits take up a specific space in our lives and serves a certain purpose. Checking your phone first thing in the morning takes up the ten minutes between 7:30 and 7:40. It might serve to help wake you up and give you a spike of serotonin before you have to face the day. Eating a bowl of ice cream every night while you watch Netflix takes up twenty minutes of your life, every night. That bowl of ice cream might serve as a ‘reward’ for a long day or an evening ritual that helps you transition to bedtime. Some people are great at quitting things cold turkey! If you are one of those people you can stop reading right now and go read this post about healthy travel snacks! But for most of us, our brains, bodies, and schedules don’t know what to do with themselves if they’re not checking that phone in the morning or eating something while watching Netflix. If there’s just a hole where the ice cream used to be, we’re a million times more likely to go back to the ice cream. We’re much more likely to break a ‘bad’ habit if we replace it with something ‘less bad’ – if we swap a bag of sand for that golden idol. I put those quotes there because ‘bad’ is subjective and most of our habits don’t hold moral value. Checking Instagram 80 times a day doesn’t make you an unkind person. Mindlessly eating pizza rolls while binge-watching Netflix doesn’t mean you’re unethical, rude, or inconsiderate. Only you can say which habits affect you negatively. Once you figure that out, think of a ‘less bad’ habit you could swap for your bad habit. What’s something you could do that feels and looks similar to your bad habit but is slightly better for you? See?! So much easier! So much more doable! Habit change isn’t always easy, but it’s totally possible and it’s a lot more possible when you’re gentle with yourself and set realistic expectations. But I want to hear from you! 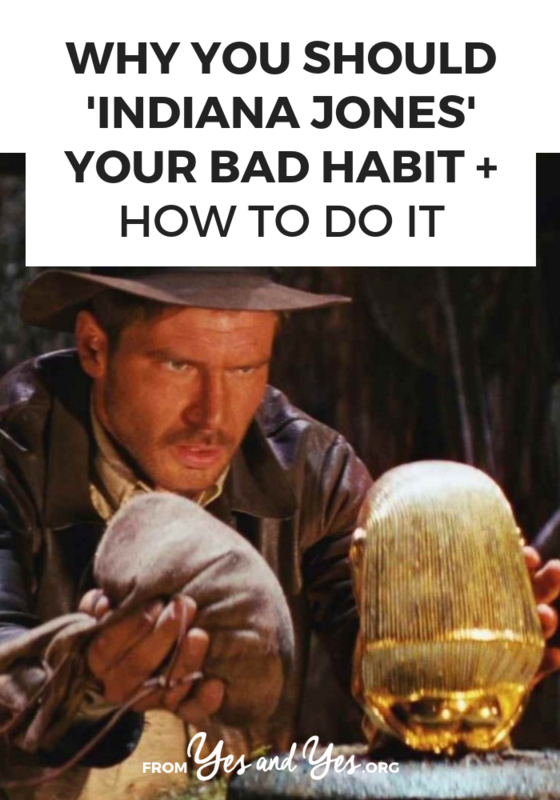 Have you ever Indiana Jones-d a bad habit? What did you swap in? Tell us in the comments so we can try it, too! I try to take a walk every time I feel stressed out or distressed etc, instead of binge-eating. Still working on it but I’ve definitely been doing much better! I like to go shopping when I’m having a rush of emotion (not necessarily a bad emotion! It usually happens when I step out of a big meeting, get that spike of relief and feel like ‘rewarding’ myself). Soooo when that happens, I take myself to the fresh produce store and splurge on a basket of kale and pineapples and things. Otherwise I would 100% be justifying the purchase of another $129 pair of ripped denim overalls or some bedazzled sneakers. I also recently started drinking kombucha in a wine glass instead of my pre-dinner cocktail and it produces exactly the same amount of happiness. Yes! I love this! I am a huge fan of a post-work ‘fancy drink’ and 99% of the time, mine is sparkling water with fruit in a cocktail tumbler!